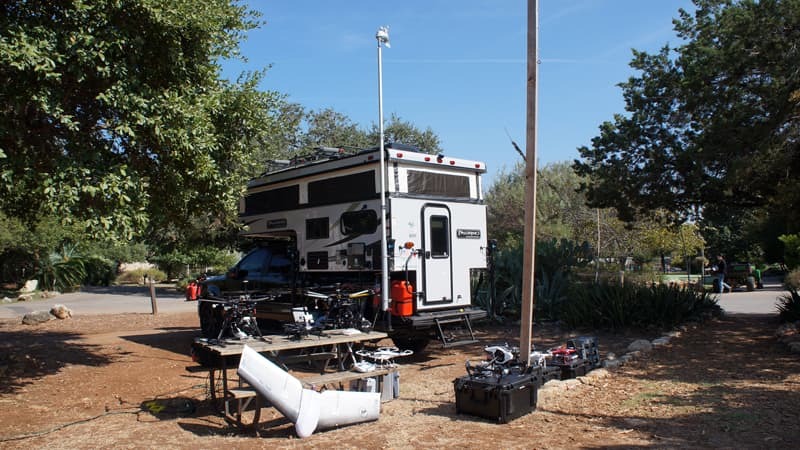 Austin Police Officer, John Buell, has converted a Palomino truck camper into a mobile law enforcement and drone command center. As the Founder of Drone Pilot, Inc., John actually flies drones from inside his truck camper during public safety missions. Then he takes his camper out for some family fun. Perhaps never before in the history of truck camping has an individual found more function and purpose for a truck camper than John Buell. At any given time, John’s Palomino SS-550 truck camper is a mobile police station, professional drone operation unit, emergency escape vehicle, and – yes – a family fun and vacation machine. John always leaves his truck camper mounted on his Ford F150, and keeps the rig fully loaded and ready to deploy. In his line of work, you never know when you’ll be needed, or where, or how long you will be required to stay on location. It could be a week protecting the annual South by South West music festival, or a month of post-hurricane search and rescue drone operations. No matter the mission, John’s truck camper is an essential tool in his public safety arsenal. John and his business partner, Gene Robinson (known as the grandfather of unmanned aerial search and rescue), have been at the forefront of drone applications for public safety, law enforcement, and fire investigation. Through Drone Pilot, Inc., John and Gene have pioneered standard practices for legal drone operation, safety, data analysis, and training. Their go-anywhere drone command center of choice? A truck camper, of course! On a much lighter note, John is also an avid truck camper for family fun. He loves taking his family to the beach for some much-deserved rest and relaxation. 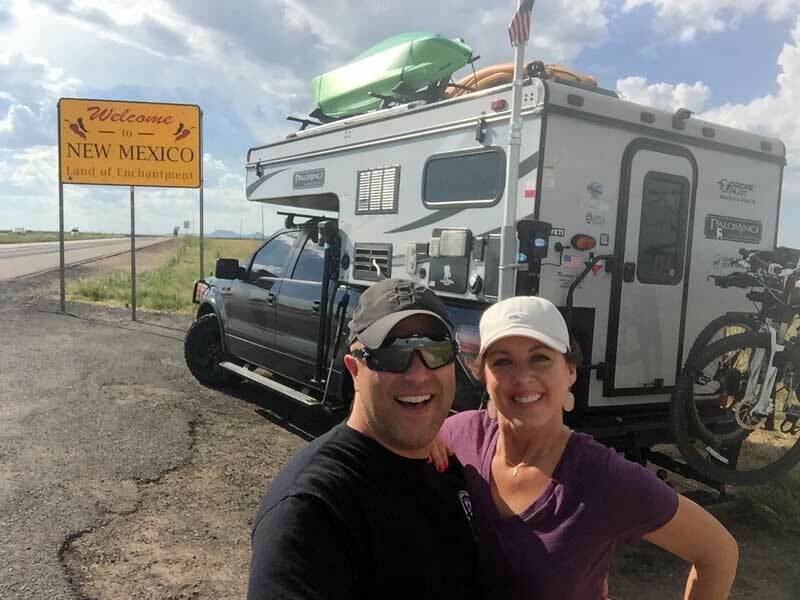 He also loves setting out to explore the west including of Colorado, Missouri, Oklahoma, and New Mexico. Get ready for one of the most dynamic and interesting stories ever told in Truck Camper Magazine. Meet John Buell. TCM: Before we talk about your police work and drone business, tell us how you first got introduced to truck campers. John: I have been into outdoor hiking, biking, and recreation my whole life. My wife and I have gotten away from tenting as we now require more comfort. I started looking at pull-behind trailers and Class C motorhomes, and then came across truck campers. Pop-up truck campers were particularly interesting because they were smaller, easier to maneuver, and provided an agile support system for both family outings and my work. A pop-up camper rig can instantly transform for work and play, and various jobs in between. My camper research began about four years ago. During that time, the Palomino SS-550 premiered in Truck Camper Magazine. After reading the article, I went to Princess Craft RV in Round Rock, Texas and bought the camper from them. The Palomino is our first camper. TCM: How did you first get into drones? Was it a personal interest, or for work? John: I’ve been flying something since I was a kid. I started with building and flying remote control planes. As a police officer, I was responsible for the wiring for undercover operations investigating organized crime. For example, there might have been an undercover bust at a hotel. I would install microphones, cameras and transmitters for the operation. The same small transmitter and camera technology also worked on my remote control planes. Ten years before commercial drones were widely available, I was playing with cameras on RC planes. They weren’t drones at this point. They were remote control planes with cameras.